From Couch Measurements to New Dining Room Set! My husband and I ran some errands, one of which was to get some general couch measurements. But then I saw this table set. It's not like I haven't seen other sets over the years, but this time, this set, I dunno....ohhhh, I love it! I have been wanting a bigger table since the day we moved into our new house. We already had a table (onlys seats 4) when we moved but we entertain alot. I've lived with the smaller table for just about nine years now and when I saw this table -it was love! Okay, maybe a little dramatic there but you get the idea. 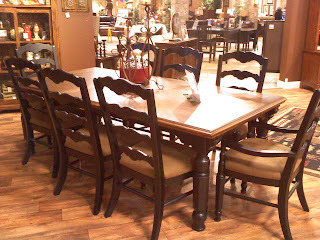 To be sure this was the table set for us and our needs, we did the right thing and shopped other stores for comparable pieces -and in our area they are all pretty well known furniture stores. The first store, I was shocked. For the prices, it looked like they were made of toothpicks. The second store, tables were better but didn't like anything. The last store specializes in dining furniture but again, nothing comparable or anything that caught our interest. So, we came to the conclusion that if we were going to get a new set, this set made the most sense. 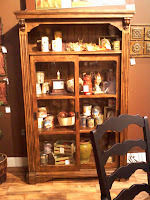 We also decided to opt out of the traditional china cabinet set up to be different and we just got the hutch. 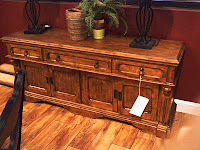 Oh, and those lamps you partially see on the hutch...got those too! Must be "old age" or something but I don't really like to put together a room from various places anymore. If I can find it all in one spot -all the better! 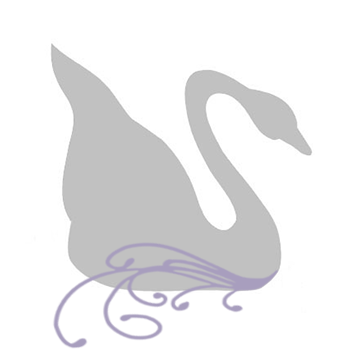 The other piece was even a little more unusual. It's called a "book shelf" but it really looks like a glass front jelly cabinet. The doors slide super easy and although it has a lot of glass area and is a little taller than I had planned, I think it's a great addition and will appropriately serve it's function. My only complaint. I wish the glass was that new antique-ish, bubbled type glass. We saw it on some country-ish style pieces. But, no biggie. At least now when we have friends over we can all sit at the table! No hauling in two-6 foot tables to accommodate, unless of course, it's a much bigger gathering. Now is the chore of clearing out the old pieces, getting them pictured and trying to sell them. But, the excitement of getting the new pieces is like christmas all over again! Can't wait to get them! I'll post pictures of both the old and new dining room sets after I get the new ones set up. Through all this excitement, I did somehow manage to get some pictures of new jewelry that will be posting soon. A few pieces have already gone up and more are coming. Enjoy your new dining room!!! I wish we had a bigger table too! Nice set! Thanks Heather! Yes, it was fun. But it's like anything. It was a large purchase so you always worry -will it work, will it look right. But, my excitement is outweighing those worries! Thanks Pearl! What's great about this set is IF we were to move to a smaller house we could take the leaf/leaves out. How exciting!! I love getting new furniture- and it sounds like it was finally time. I love that glass bookshelf type cabinet- I'd love something like that! !